Overview : NeoFlash Top Toy DS (TTDS), support SDHC 256Gbit, plug and play, support cheat code and soft reset! Support normal TF and SDHC, up to 4096GByte. 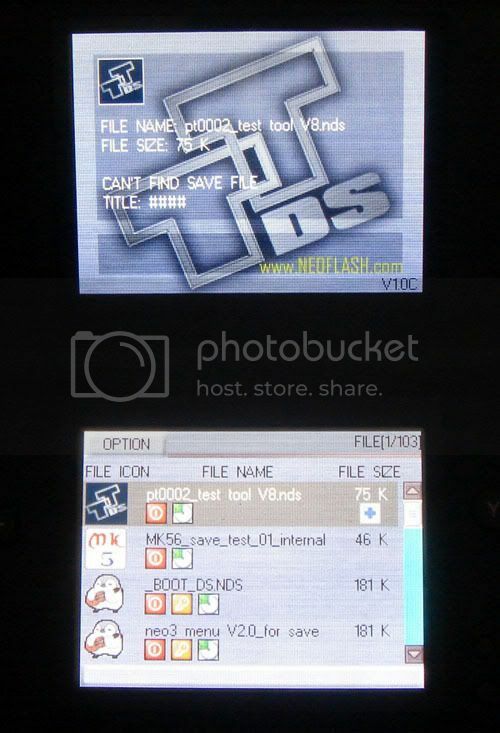 Quality/Usability : The Top Toy DS (TTDS) is a new slot-1 flashcart released by NeoFlash. They're known for other DS flashcarts as well as memory adapters for the PSP. The TTDS comes in a blister pack included with TTDS Flashcart, microSD USB reader and a mini-CD. Each time a manufacturer releases a flashcart, it seems like these USB microSD readers get smaller and smaller each time. Not to mention, if you buy flashcarts regularly for whatever reason whether its for collecting, you'll have lots of them. The mini-CD contains some drivers but to download the latest TTDS menu, you can download it here. Once downloaded, copy over the files to the root of the microSD. You can copy over your hombrew and games into any folder on the root of your microSD as well. 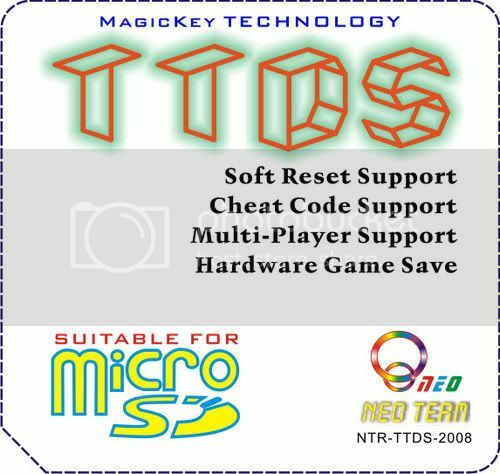 Upon booting up your Nintendo DS, TTDS automatically skips the Nintendo DS logo and brings you to the main menu of TTDS which displays all of your hombrew and games that you copied over to your microSD. Back on the main menu, each game will show icon (if available), file name and size. Under each file name are additional icons. For those who dont know, soft reset allows you to exit your game and it brings you to your file list of games. In order for soft reset to work, you must enable it and once its been enabled, simply push the following buttons simultaneously..."L+R+A+B+X+Y". If done correctly, you'll be take to your game list. Cheat tab will take you to another menu where you can select which games you want to enable cheats for. Cheats will be listed for those you've selected and it will list cheats for all regions. Choose the correct region of your game. These flashcart manufacturers pretty much has NDS games performance down pact. All the NDS games I have loaded, booted up perfectly without a problem. Load time was quick as well. Download play was iffy a couple months back but now, these manufacturers have no problem and games run perfectly. Whats great about these flashcarts is the ability to play homebrew games. Homebrew games are applications made by amateur developers. There are applications such as games, PDF applications, calculators, music/video players and many more. These are stuff that normal developers/publishers wouldnt release but are useful to average gamers. TTDS supports automatic DLDI patching. DLDI allows people to patch homebrew files in order for it to work on a flashcart. It is pretty much found on all newly released flashcarts as it is a standard feature. Without DLDI patching, homebrew would not work on certain cards and developers would need to release different versions of their app to work specifically with that flashcart. DLDI will do all the work. Conclusion : Overall, the NeoFlash Top Toy DS TTDS is another flashcart on the market. It supports the new microSD SDHC flawlessly. What is nice about the TTDS is that it can also load R4DS game saves and cheats. TTDS works great but like all other NeoFlash flashcarts, the menu and OS isnt the prettiest of them all. But so as long it does the job well...who cares?